Have you heard about the recent hit dramas Decent of the sun, Misaeng or the famous reality cooking show Three Meals a Day? These were made by one of the rising content providers CJ E&M, which has distributed the recent hit media contents through diverse channels. Following the core spirit of the company “No culture, no country,” the company takes the lead in the globalization of Korean culture encompassing entertainment, music, film, lifestyle, cartoons and other media fields. Also, the company is famous for its enviable reputation as many young job seekers, who are interested in marketing and advertisement, want to enter. 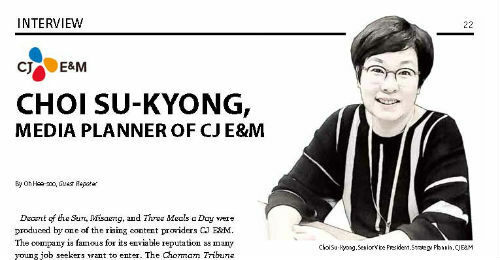 The Chonnam Tribune interviewed Choi Su-kyong, a senior vice president in the strategy planning team of CJ E&M by e-mail. She talks about her life story and introduces the occupation, media planning and the philosophy of working as an expert in her own field. Furthermore, she delivers a message to youth and her juniors at Chonnam National University. - Ed. Q. What was your first career before working for CJ E&M? A: I worked for an advertising company in the ‘Media Planning’ field for 13 years as my first job. Briefly describing about media planning, media planners usually manage client’s requests of the advertising company, set up business objectives, analyze the advertising strategies for the upcoming year and monitor industry trends. Since this field is quite different from copywriter’s work that I had imagined before, it was so unfamiliar and difficult for me to understand. At that time, there was a small minority of experts in the media planning field. So, I had to look for related publications and repeatedly asked seniors to get further information. Q. How could you build your own expertise in the field? A: To build my own expertise, I constantly tried these three things. At first, I am always looking for an optimal answer, not a correct answer. Basically, I asked for advice about media planning, and general things about this field from others. Moreover, I continually communicate with the clients, staff in advertising companies, advertisers and even asked myself “Are there any other alternative ways?” or “Is it the best way?” repeatedly. Secondly, I try to gather and analyze a lot of data regarding the environment of the market, rival companies, associated business groups and trends. Finally, most clients want to be an industry-first. So, I always search for innovative ideas including creative storytelling to reflect a clients’ request. Now, these procedures have become my old work habits. Q. What did you want to be when you were growing up? Also, I am wondering about the experience or person which had a great influence on you and made you decide to work in the media field? A: It is hard to count because I dreamed so many things when I was young. Actually, I dreamed of becoming a copywriter. When I prepared for university applications, I applied for the communication major with an ambiguous plan to be a reporter or producer. Meanwhile, I heard that there were advertisement contests for university students from my close friend who was in the college of fine arts in my second year of university. Then, I started to take part in some large and small scale of advertisement contests for university students. From the summer vacation, I made a team with friends majoring arts and tried to submit some work for several advertisement contests. Fortunately, I won the prizes at some contests and made my own career through the experiences. My own experiences in various contests and creating portfolios were a big help in entering the company. Q. Also, I am wondering about the experience or person which had a great influence on you and made you decide to work in the media field? A: In my case, I started to establish my own goals and grew up with the companies, senior-junior relations and many related field experts. Naturally, I decided my future career to be in the advertisement field. Thanks to my academic adviser, I got an opportunity to get a job at a newly established advertisement company by the time I graduated. However, there was no specific subject to let me know about the advertisement field at that time. Instead of taking a class, I met some seniors who already worked for an advertisement company and asked them for advice to set up a specific goal. Q. Nowadays, most university students are focusing on specification, so called SPEC, which makes their own careers to get a job. How did you like your university life? A: When I have a job interview with our executive team, we always talk about the youth of today. We all agree with the opinion that if we were born in times especially like this, we would not apply not only for CJ E&M but also for getting any job as well. I am really sorry for the situation that most of the university students are desperately focusing on making careers in their youth. Definitely, as do other university students, I traveled somewhere with my friends and had all-night drinking sessions in university. However, I relatively quickly decided my goals compared with others and did my best to achieve them. To sum up my undergraduate days, I took part in some activities in my department in the first year. From the second year, I prepared advertisement contests with friends and earned money through working a part-time job. Also, I got an internship when I was in the senior year and directly got a job after graduation. As I look back on my young days, I think I was absolutely a lucky case. Q. 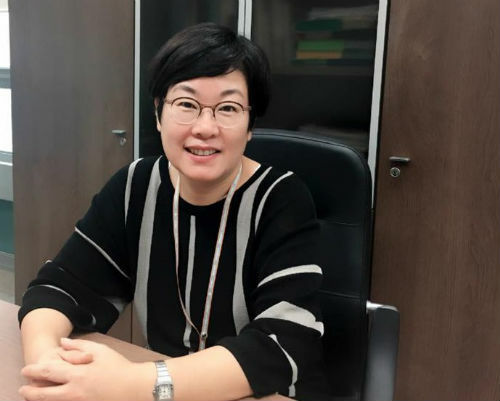 Recently, a new-coined expression ‘Jiyeoin’ is the abbreviation of local university, a woman and humanities college, which reflects the desperate low recruiting rate situation of these three groups. Were there any difficulties because of graduating from a local university or being a woman? Moreover, how did you overcome the difficulties that you faced? A: I remember that I won a radio advertisement contest by the time I graduated. I could be able to have an opportunity for open recruitment interview with the advertisement company. I dressed up for the day and had an interview with a delighted heart. However, the interviewer asked trivial questions for me contrasting with other two interviewees. I was so shocked at that time because it was the first time for me to realize the limitation of local university students. As for me, the hardest time while working was not graduating from a local university or being a woman rather it was pressure to get married early, go through childbirth and rearing babies. At that time, it was not a common thing that new a employee get married and get pregnant after a year of entering a company. So, this question about how I overcame the difficulties strikes me that I lived each day earnestly at that time. I really tried hard and tried to be with these kinds of resolved spirit ‘I have to be the only person who needs me,’ ‘I have to develop my own ability that no one else can substitute for me,’ and ‘I already do the work before ordering me to do another duty.’ I even submitted a request for maternity leave only for a month and directly came back to my work place. I often brought my child to the work place when I had to do the work during the weekend. Despite this, I considered it a great fortune because there were not many people who can be a substitute worker instead of me at that time. The only way to overcome the difficulty that I faced was working hard, being recognized for my abilities and finally ensuring supporters of my own. Q. Finally, please leave a message for Chonnam National University students and youths called N-Po Generation who give up the things like dating, marriage and childbirth due to unemployment nowadays. A: I think this is the hardest question for me to answer. So, I repeatedly needed to write about something and then erase it. Recently, there was an impressive phrase that I always have shared with my colleagues and familiar people around me. I want to introduce you to the message from Alice through the looking glass by Lewis Carroll instead of leaving a specific message. Alice: Why do I run to stay in the same place? Red Queen: My dear, here we must run as fast as we can, just to stay in place. And if you wish to go anywhere you must run twice as fast as that. Through this phrase, I realized that if I keep my dream with a date, it become a goal. And, it becomes a plan if I divide my own goal. Finally, if I really put the plan in to practice it would come true. Furthermore, I really hope all the readers and youths who will read this article have a chance to bring happiness into their lives and remember it is not about finding a correct answer, but finding an answer of your own.